The definition of a bruin is a bear. An example of a bruin is the mascot of the Boston hockey team, the Blades. "Bruin." YourDictionary, n.d. Web. 16 April 2019. <https://www.yourdictionary.com/BRUIN>. Middle English name of the bear in History of Reynard the Fox , translated by William Caxton from Middle Dutch bruun, bruin brown, name of the bear in the Middle Dutch version of the fable ; see bher-2 in Indo-European roots. From Dutch bruin (“brown”) via William Caxton's 1485 translation of a Dutch version of the legend of Reynard the Fox. 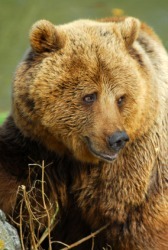 Bruin is the bear, named for his brown color. Each year, six candidates are chosen to fulfill three Josie Bruin roles and three Joe Bruin roles. While prior dance experience isn't necessary, the UCLA Bruin dancers describe themselves as an 'elite' dance squad and demand solid dancing skills at try outs. That doesn't mean be fake and "big", it means really make an effort to show the panel of judges that you would be the best Josie/Joe Bruin ever. And we'll take Bruin with us.